Render text in any language that has codepoints in Unicode. Specify bidirectional text modes (BiDi modes) specified in Classes.TBidiMode. 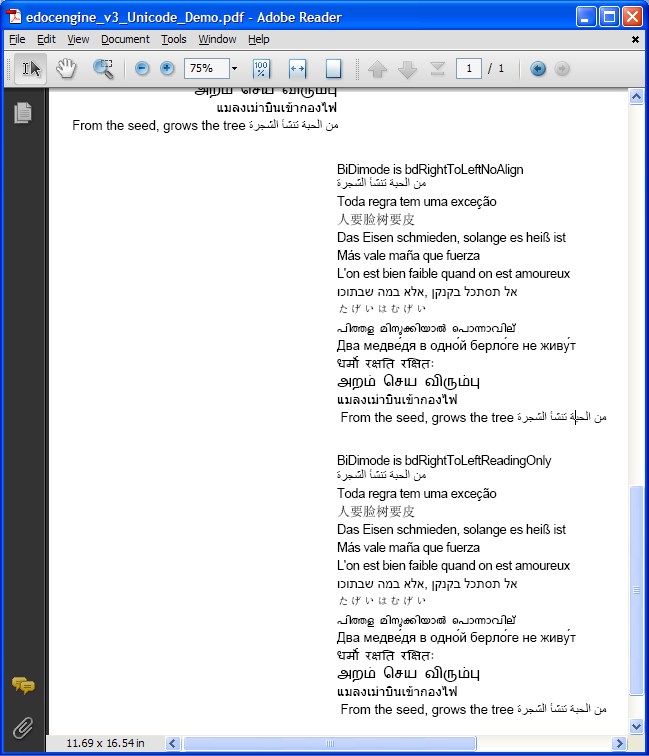 Render text that are written from right to left such as those in Arabic, Farsi or Hebrew. Reduce file size of document by performing subset embedding of PDF fonts in a more compact manner. 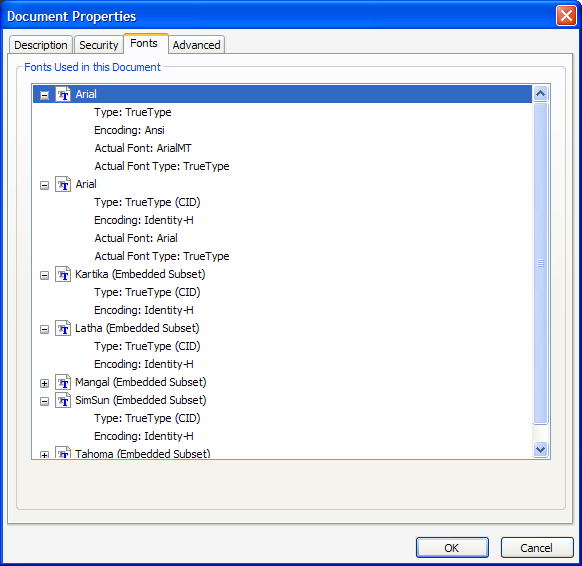 In eDocEngine v2.x, the PDF engine class TgtPDFEngine had a boolean property Bidi. In Version 3, this property is replaced with another property BiDiMode. You can use a Classes.TBidiMode enum value to set the value of this property. 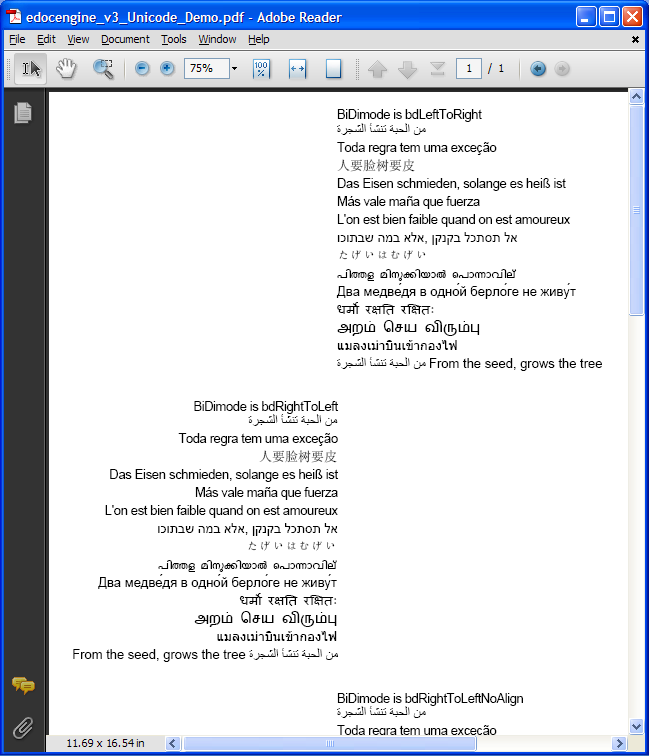 Following is some sample code that illustrates Unicode capabilities of the PDF engine. In this code snippet, text in several non-English languages are rendered on a page under different bidirectional text modes. The default page font is set to Arial. However, to render text whose glyphs are not present in Arial, the PDF engine automatically finds a more suitable font. All of these fonts are set to be subset embedded in the code. Arial has been excluded from getting embedded, simply to demonstrate that it is possible to exclude certain fonts in that way. And, here is the output in screenshots. Finally, examine the fonts used in the document. Thanks to the automatic and intelligent font mapping, you do not have to specify Arial Unicode MS or some other big polyglot Unicode font to support multiple languages. eDocEngine Version 3 does all that internally. You only need to have the appropriate fonts installed in Windows. Please note that the above code snippet requires the PAS file to be Unicode-encoded. 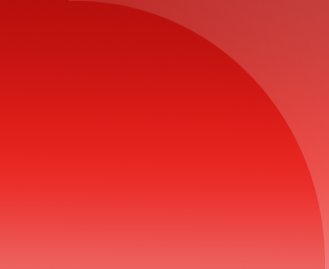 You will be able to use it in Delphi 2007, 2009 or 2010. If you are using an older version of Delphi, then you could read the Unicode strings from a stream and store them in a TWideStringList. Alternatively, you could load them off TNT Delphi Unicode Components. The test phrases and the meanings are listed below. French - (Madame de La Fayette) One is very weak when one is in love. - L'on est bien faible quand on est amoureux. Russian - Two bears don't live in one lair. - Два медве́дя в одно́й берло́ге не живу́т.